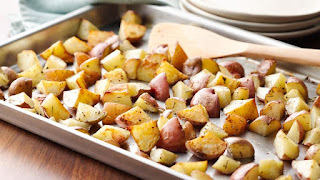 Delicious side dish to any meal! Dice up all the vegetables the same size and coat them in oil and salt and pepper (and other seasonings if desired). Bake them until cooked through. 350 degrees for about 20 minutes. Dice the potatoes into cubes. Coat in oil and salt and pepper. Bake at 350 degrees for around 20 minutes or until soft and cooked through.